Pentagram partner Daniel Weil has created a new design for the chess set, which is making its debut at the World Chess Candidates Tournament in London. Weil was asked to design the new pieces following Pentagram’s earlier work with organisation World Chess, which saw John Rushworth create a new identity for the organisation, Naresh Ramchandani work on campaigns, and Weil design the playing environments. World Chess is operated by entrepreneur Andrew Paulson, who wants to return chess to its 1970s levels of popularity with new interactive and televised coverage. 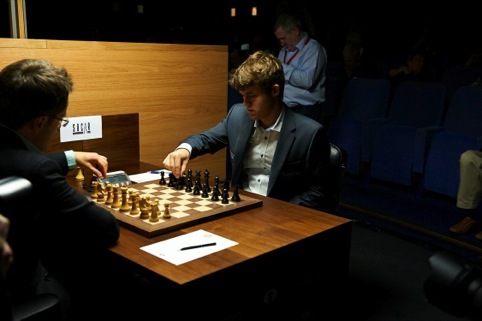 Those competing in the current tournament include 23-year-old Norwegian Magnus Carlsen, who is rated as the best player in history. Weil says, ‘Chess is such an extraordinarily popular pursuit, and we’re aiming to give it more visibility. 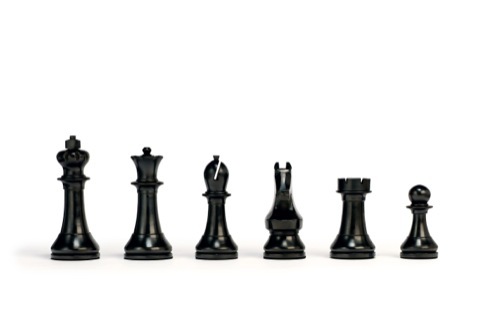 Weil says he looked to the Staunton Chess Set, first produced in 1849 and used for competitions since then, for initial inspiration. The Staunton set was designed by Nathanial Cook. Weil says, ‘He was an architect, and the set had certain characteristics common to Victoria Neo-Classical architecture. Carrying through the Classical theme, Weil linked the eight major chess pieces to the eight columns of the façade of the Parthanon. He redrew the height of the pieces to reflect the pitch of the façade, so that the pieces before play would evoke the structure of a Classical building. 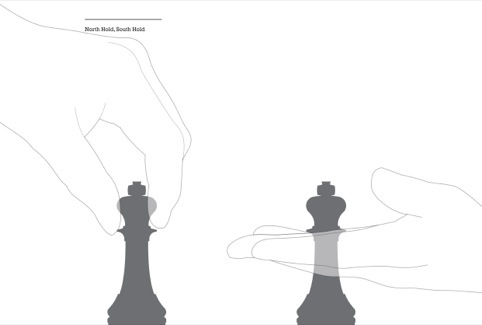 This provides visibility for the pieces throughout the game, while hierarchy is expressed through the width of the pieces, with the King having the largest base. The Knight, which Weil describes as ‘the least architectural piece’, due to its form and peculiar move (it is the only piece allowed to jump over others) has a base that resembles a hoof. Weil also changed the colour of the material under the pieces, which was originally green baize – reflecting chess’s popularity as a Victorian parlour game. The green colour has been replaced by black and white felt. 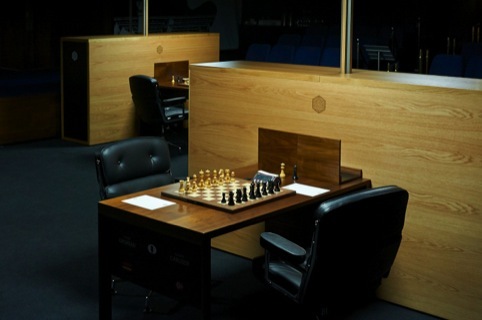 The set is being used in the World Chess London Candidates Tournament, which is taking place at the Institute of Engineering & Technology until 1 April. It is also available to buy here. I’d get a set, love chess. 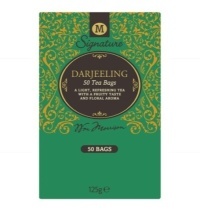 Does anyone know if this is available to purchase online? Great article, thanks for this! I haven’t read anything this detailed about the new chess set on any chess website. I’d like to add though that as beautiful as the new pieces may be, many players, including some of the participants in London, have pointed out that they seem a little too large for the boards they are used on. 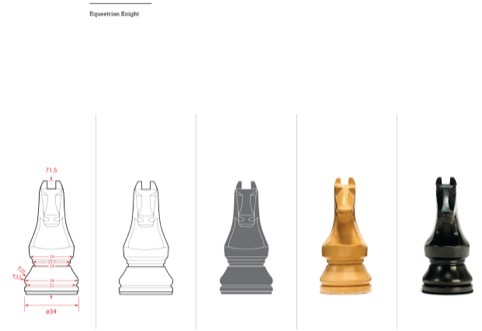 It’s just a *wee* bit of a stretch to say that Daniel Weil has “redesigned” the chess set. This is merely a mild reinterpretation of the truly authoritative groundwork that has been laid by the masters over the years. Pentagram doesn’t reinvent everything it touches. “North hold; south hold; theatrical disdain.” Oy. To say that “when the initial Staunton set was produced there was great precision – since then a disrepair had set in” is absurd. Check out some of the work here — http://www.houseofstaunton.com — then tell us a bit more about this disrepair. Finally, I think it says a lot that the knight is not shown in profile in any of these photos. This is the piece that real chess players want to see in profile. This is standard stuff, people. The fact that the dark pieces are black kills this set stone dead for me. Black pieces reflect the minimum of light, whereas brown dark pieces reflect more light and they make the position on the board more instantly comprehensible. It’s interesting that the board shown in the photograph at the top of the article has brown dark squares. Why should that be if you think that black is the definitive colour for the dark squares and pieces? Also the shanks of the kings, queens and rooks are too thick. Howard Staunton’s specifications, which he gave to Nathanial Cook the turner and to John Jaques the manufacturer, was that the shanks of the taller pieces be slender so that they would not conceal smaller pieces in front of them. Altogether this set is a betrayal of what I understand to be good design. 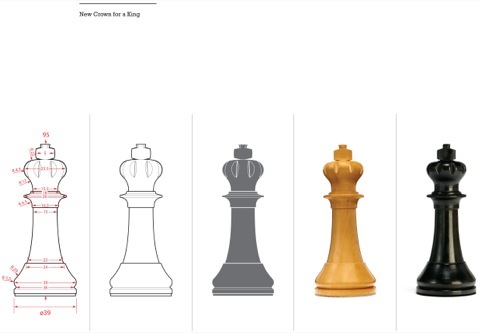 and…The King, The Queen, The Rook and Pawn have the same design, or the similarities are so amazing!! Only The Bishop and Knight are diferent! The Knight is clear an improvement based of normal DGT pieces! Well inovation…bla, bla, bla! And yes… the set is nor for the Candidates Board! The pieces are “muffled” in the squares! This Set is good, nothing more! Far away of Jaques or British Chess Company, Ayres and so on! Hi, I am the owner of The Regency Chess Company. We do sell a budget set of chessmen called ‘The Pioneer’ and have stocked them for over a year. They are in no way copies of, or indeed even similar to the official world chess set which we are also an authorised stockist for. I am also collector of fine artistic and innovative chess pieces. This set is simply copied from a mix of the common German design set and added a small amount of flair in the shafts of king/queen etc. The set is overpriced as it is simple boxwood and stained black, which you can purchase at retails all over for less that 40.00 usd. I have over years a fine collection but my favourite place to buy quality at remarkable low cost has to be ChessMaze shop UK they have in my opinion the best sets at such good price for actual innovative design set. 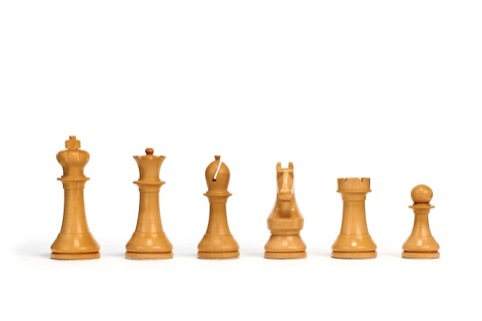 This World Chess set is quite normal? nothing extra appealing to me anyhow 🙂 funny is the chessmaze also selling the world chess too! This so called new design is nothing more than a direct copy of the German design that has been on the market for over 30 years. When i look at this set all i see is the German Design. The set is overpriced as stated in the post above. It is simply a ripp off in my opinion. The pieces are simply turned, there is no intricate hand carving and the material is natural boxwood and stained boxwood. The set has little or no value in terms of material used either! Boxwood is not an expensive material. The hype that this is the set of future tournaments is overly exaggerated and even with its FIDE backing wont take off. Finally how it is acceptable that an existing design can be copied and given a new brand name, mass produced and on the market, legally? I design things for a living – many different things. This set is an embarrassment, overall. 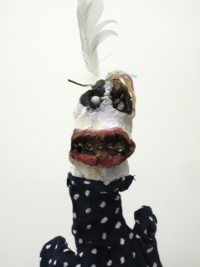 Too big for its board – nothing but a mismatched rehash of other people’s work. A knight that is ridiculous! – it’s out of proportion and out of shape. Saying that this effort is based on or developed from (insert some classical illusion) is redolent of some Hollywood film that is ‘Based on a true story’, i.e. fictitious. The set is ‘not bad’ in parts, but I, like many, would expect to elevate it to ‘good’ throughout in a very short time indeed! Why an earth would you go to an architect if you want good design? While the king is different, most of this set is hardly a fresh design. The knight, usually the star of the show looks as if it belongs in a crude starter set to me. No wonder there is no profile view. This set does not serve well aesthetically or functionally. Tournament players and collectors deserve better. I agree with many of the comments above. This “bold redesign” is a modest tweak, really–the kind of marginal tinkering that is so common in, say, typographic font design that springboards from the classic fonts. 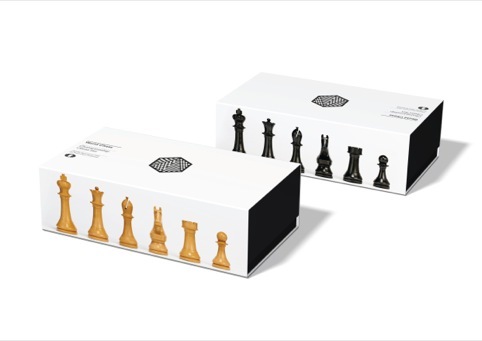 Don’t get me wrong–this is a handsome chess set–but largely because the Staunton design itself has proved to be so profoundly satisfying as THE visual and physical embodiment of the world’s classic game. It would be tempting to consider altering some of the symbolism that’s so firmly rooted in Staunton’s British heritage–Monarchic rule, Christian religious authority, and Arthurian knightly behavior–but Mr. Weil wisely avoided that. As others have noted, the display is astonishingly lacking in a lateral view of the knight; this is particularly irritating when the discussion references the “agonistic” aspects of the original. On the whole, Mr. Weil can be proud of carrying forward a sound traditional look without screwing it up–but I would defy anyone to pick this set out of a lineup of 10 other examples of Staunton-based variations and identify it as the new, improved, and unique visual embodiment of the game. This design makes me puke. “Each piece based on the columns of a classical Building..” LOL, What a bunch of mumbo jumbo!! And someone please feed that poor knight a cheeseburger. This design makes me puke. 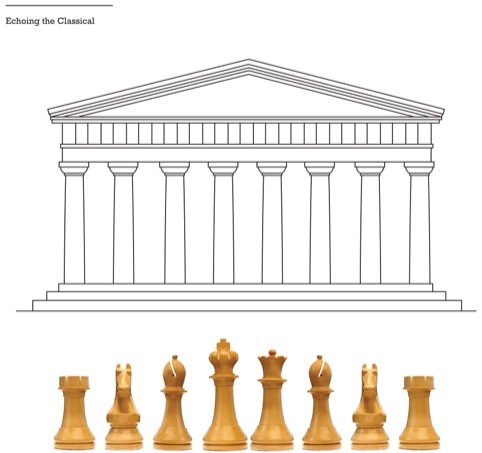 “Each piece is based on columns of a classical building…” LOL, What bunch of mumbo jumbo!! And someone please feed that poor knight a cheeseburger. To “unravel the rationale behind the original set” sounds pretentious to me. I would have thought that the “rationale” was functionality in an aesthetically pleasing form. Of the myriad styles of chess sets would this be anyone’s favorite?